© By Linda J. Brodzik, Dog Trainer & Behavior SpecialistAs we are learning, an individual dog’s behavior and temperament is guided by many interdependent environmental and genetic (i.e. biological) factors. Genetics set the predetermined limits to an individual’s traits and learning potential. Learning through environmental experiences fills the limited boundaries of an individual’s potential behavior and temperament. Environmental learning can have either a beneficial or destructive effect upon an individual’s behavioral development. Every given moment offers the opportunity for either constructive or destructive influences in learning. Inappropriate or insufficient experiences in a puppy’s environment can cause for abnormal development or specific behavioral systems to atrophy. Early experiences are especially critical in shaping behavior patterns, coping skills and temperament. Puppies that are isolated from other puppies and dogs, sufficient human interaction and the physical world around them early in their life develop insufficient social skills and poor problem solving skills. These puppies are also prone to either hyperactivity or rigid inhibition, are emotionally overactive and tend to be fearful of novel, social and environmental stimuli. Isolated puppies also tend to be sexually incapable. Puppies that are reared in isolation or careless conditions will have a great disadvantage in their capabilities of developing into a confident, social and well-mannered companion dog. 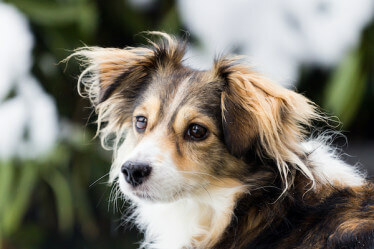 Dogs undergo several biologically guided learning and social periods as they mature. The onset of these stages renders an individual animal susceptible to crucial experiences (or the absence of such) for a limited period of time. 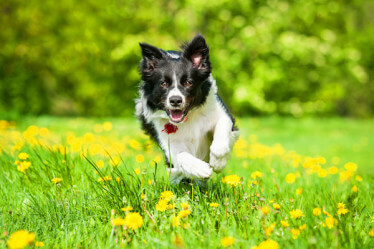 During these stages of development, a short period is allowed for the maximum effects and benefits of a specific learning development in dogs. The first stage is the neonatal period, which lasts from birth to 12 days of age. Just prior to birth, puppies are exposed to hormonal changes that cause for sexual dimorphism. Male puppies are exposed to a surge of testosterone, setting the foundation for male behavior later in life. Prenatal androgen secretions are believed to play a role in the forming of behavior neurotracks associated with maleness. Research has suggested that female puppies may also be affected by the androgenizing. Studies with female mice embryos located between two male embryos in the uterus appear to be influenced by the presence of vagrant testosterone carried in amniotic fluids. 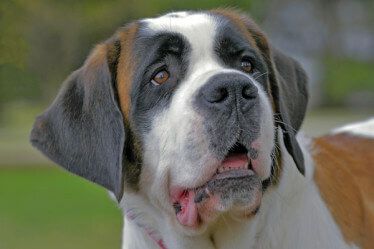 It is possible that a similar effect occurs in female dogs, although studies have not yet confirmed this. At birth, a puppy is unable to control its body temperature and is very sensitive to changes in the environmental climate. By keeping in contact with its mother and littermates, a puppy’s temperature can be kept constant. A puppy that becomes too warm will move away. Puppies at this stage will exhibit extreme distress when separated from their mother or littermates and become too cold. Studies observe that a mother would readily retrieve a puppy that has become separated for up to the first five days, but after that will stop doing so. As for the neurological and sensory perspective, puppies are born deaf and blind. Most of the young puppy’s time is spent sleeping and eating. Urination and defecation is elicited by the mother’s licking of the puppies’ bodies for at least the first two weeks. Motor skills are limited at this time to a swim-like crawl involving predominantly the front legs. Although young puppies are developmentally isolated from the environment, studies have shown that some environmental influences can have long-term effects on learning, as well as emotional stability and general adaptability. Just three minutes of handling by a human per day and the exposure to mild environmental stressors (changes in temperature, gentle physical manipulation, etc.) can have a positive impact on a puppy’s resistance to disease, its emotional stability and learning, and the ability to solve problems when it reaches maturity. 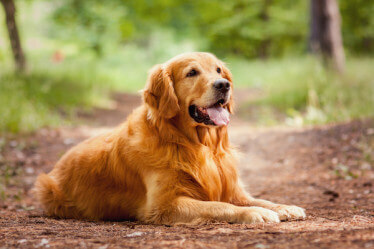 Dogs left undisturbed during this period are found to be more emotionally reactive as adults. During this stage, puppies move from “vegetative functioning” to a more complex approach and withdrawal behavior. As a puppy develops, these patterns become more complex in response to environmental stimulation. Approach behavior develops into curiosity or seeking behavior. Withdrawal behavior develops into escape or avoidance behavior. Although neonatal puppies are capable of learning, this is limited to the association of primitive stimuli and adjustment responses. The transitional period progresses from day 12 to day 21 of a puppy’s life. During this stage, a puppy displays a marked progression in neurological development. Puppies will show a steady improvement in locomotive abilities. This includes the opening of ears and eyes and the improved control of voluntary behaviors. 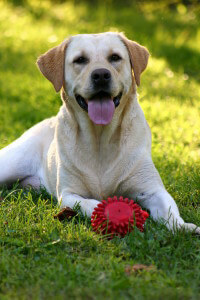 Puppies become more active and independent during this stage. A puppy develops greater ability to support itself and can stand on all four limbs and walk (albeit unsteadily) as early as 12 days. Puppies can be weaned and taught to eat gruel as early as 16 days (although this is not advised). A puppy can also eliminate voluntarily, but this has not often been observed prior to 20 days of age. Although nursing is still of great importance, physical contact and comfort seems to take precedence. 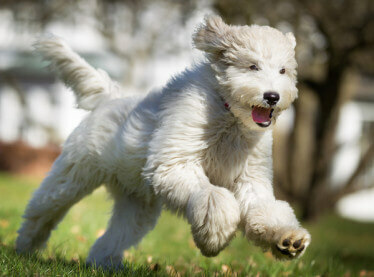 At this stage, puppies experience rapid increase in development in response to both social and environmental stimuli. Although learning is still limited, evidence does support some development in avoidance behavior. The important development that occurs during this stage is the transformation between reflexive behavior to the awareness of both social and environmental stimulation. 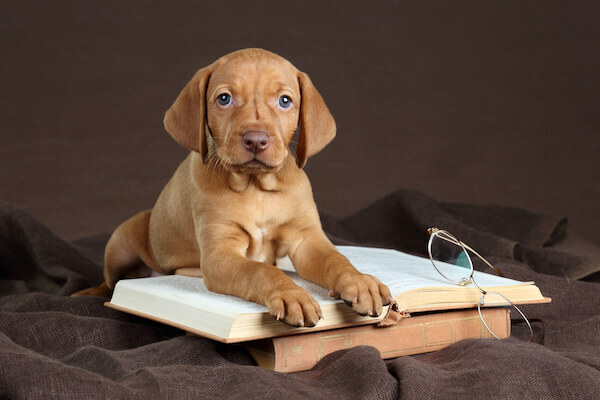 Within the onset of the primary socialization period at approximately 3 weeks of age, dramatic improvements occur in the puppy’s ability to learn. The socialization periods are by far the most important growth and developmental periods of a puppy’s entire life. They extend roughly from 3 to 12 weeks of age. These periods allow for the development of many important and lasting social and learning skills. Behaviors concerning appetite, social affinities, aversions, patterns of active/passive reactivity, sexual behavior, pack behavior, play, reactivity to separation and other emotional stimuli, explorative behavior, fear and avoidance patterns, learning and problem-solving patterns and trainability are all set during these important periods. The treatment and experiences of a puppy during this stage will strongly affect virtually every functional behavior system. The primary socialization period extends from 3-5 weeks of age. Many inter-related emotional tendencies and behavior patterns develop at this time, opening the door for active social awareness and responsiveness. At this time, puppies begin to exhibit heightened signs of distress, such as vocalizations and physical efforts to reunite when separated from the mother and littermates. Group activity and play behaviors appear at this time. Playful sexual and aggressive behaviors frequently occur among littermates. Predatory behaviors such as stalking, pouncing, and shaking also appear. Such behaviors are directed toward both littermates and inanimate articles that provoke curiosity. Sparring between siblings occurs readily during this stage although submissive/dominant positions are unstable and shifting. This period may be an important one for a puppy’s acquisition of bite inhibition as puppies display a great deal of mouthing and biting behavior between siblings. 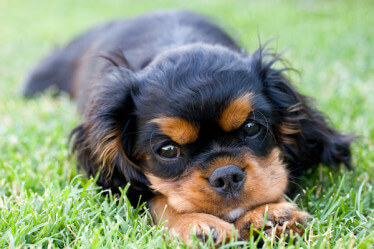 Puppies that are weaned too early, or that are born to a single puppy litter, may display a harder than normal bite as they have not been given the opportunity to learn proper inhibitions. This period is vastly important for the development of a stable emotional temperament. 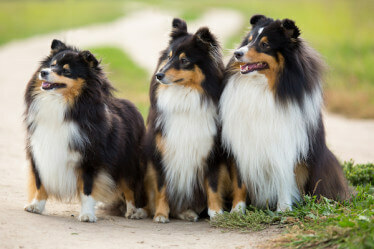 Removing a puppy too early from its mother and littermates is believed to be the cause of many social and emotional difficulties displayed in adult dogs. Behavior problems seen often include over activity, emotional rigidity, and increased anxiety. Puppies removed too early are also prone to developing problems with excessive barking, separation distress, compulsive destructive behaviors and aggression directed towards other canines as well as humans. A mother will leave the whelping area more frequently and for greater periods of time during this period. 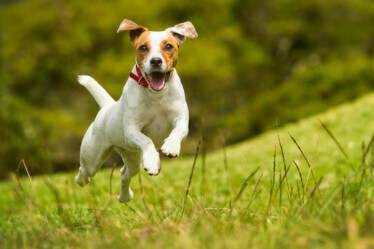 Puppies tend to wander farther and leave the nesting area to eliminate on their own. At this time, puppies can be taught to eat semi-solid food. 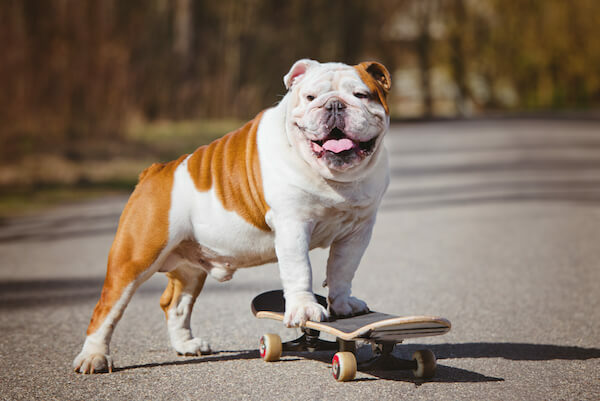 Also, at this time puppies begin to display more involved explorative behavior such as sniffing, pawing, chewing and tearing, and picking up and carrying a wide variety of objects. Puppies become enthusiastic to new social stimulation but also display preference toward familiar individuals. Puppies also begin to display expressive tail wagging at this time. Between 5-7 weeks of age, a fear of strangers appears. This develops over several weeks and ends with the close of the socialization stage at 12 weeks. 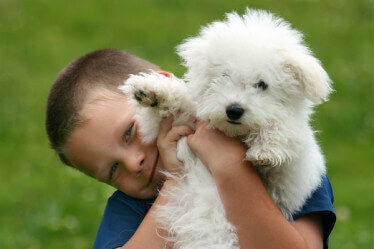 The secondary socialization period extends from 6-12 weeks of age. For many puppies, this marks the transition from living with its littermates and mother to living with his/her new adoptive human family. This transition is peered by its mother’s increasing irritability toward her pups whose sharp teeth work to discontinue her desire to feed them. It is not surprising that maternal punishment peaks around this time. Also peaking are the antagonistic behaviors displayed between littermates. Distress vocalization and reactive behavior exhibited during brief isolation from littermates peeks at about 7 weeks and rapidly declines as about 10 weeks approaches. A puppy’s willingness to approach strangers also peaks at this time. Puppies also display confidence in approaching novel objects within the environment. Probably the strongest support encouraging adoption at 7 weeks of age is that the progressive potential for fearfulness toward social approach occurs at this time and ends with the close of the socialization period at 12 weeks of age. These two opposing social patterns (fear and attraction) intersect during week 7. Puppies appear to be most efficiently prepared for sexual development during a short period around 7 weeks of age. This does not suggest, however, that puppies younger or older cannot benefit from socialization. It is not necessary to delay socialization until 7 weeks of age. Five-week-old puppies are more outgoing and less fearful of social contact than 7-week-old pups. It would benefit breeders to initiate secondary socialization prior to the normal adoption age of 7 weeks. Daily handling of each puppy and adding novel visual, tactile and auditory stimulation to the puppy’s environment can increase acceptance to novel environmental stimuli later in life. Throughout life, an individual dog will move in and out of critical periods of learning and development. Often overlapping, these periods occur rapidly in young individuals and then taper as an individual matures. I have discussed the most important periods pertaining to the development of temperament. Breeders would be wise to learn as much as they can about these critical periods as such knowledge can help to shape the positive development of each new generation. Further, by empowering puppy buyers with such knowledge, breeders can help to ensure the proper follow-through of acceptable temperament and development. When looking to adopt a new puppy into your home, individuals should be conscious of, and attentive to, the environment in which the puppies are being raised, as well as the temperament of the litter’s dam and sire. Read about How Dogs Learn.